Investing in China has often been met with a bit of hesitation because of concerns about the country's state-owned enterprises. China's SOEs account for near 40% of its stock market and more than a third of its public investment. There are two main worries about investing in China that are specific to SOEs. The first is that minority shareholder interests might not necessarily be the top priority for SOEs. 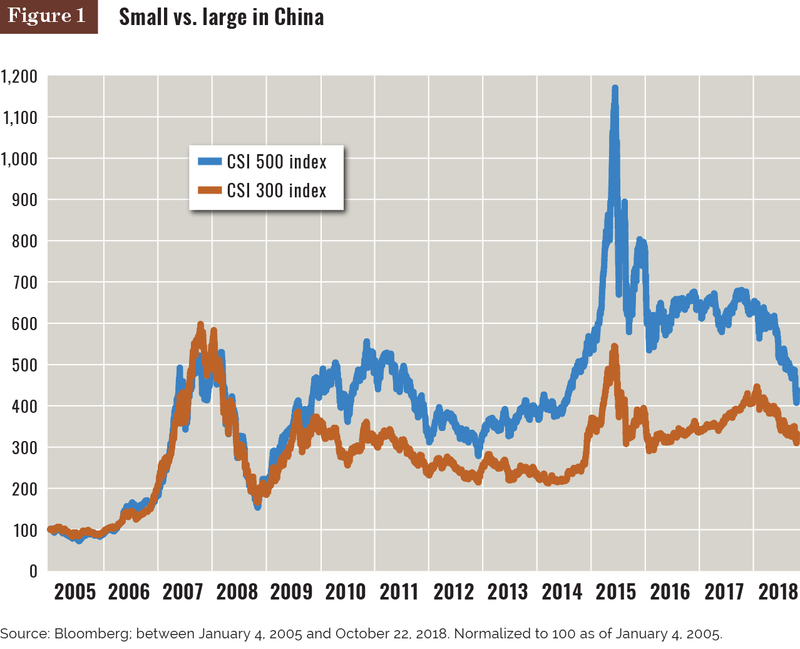 Indeed, taking size as a proxy for SOEs, the CSI 500 index has outperformed the CSI 300 since 2005, but has given up some of those gains starting in 2017. Secondly, investors worry about the debt on the SOEs' balance sheets given that the SOEs can tap cheap financing from state-owned banks. However, major strides of improvement have been made in both areas: total operating profits for the top 60 listed SOEs (excluding banks) have risen by 17% since 2016, according to the Economist, which cites Bloomberg data. Regarding the debt levels, in January, analysts from Moody's forecast debt/EBITDA ratios at the SOEs to decline to "5.4x in 2018 from 5.5x in 2016 and 5.7x in 2015." Indeed, SOEs at the right price can pay off. After a big sell-off in 2015, China's SOEs recovered in the subsequent three years due to their potential valuation proposition (Figure 2). 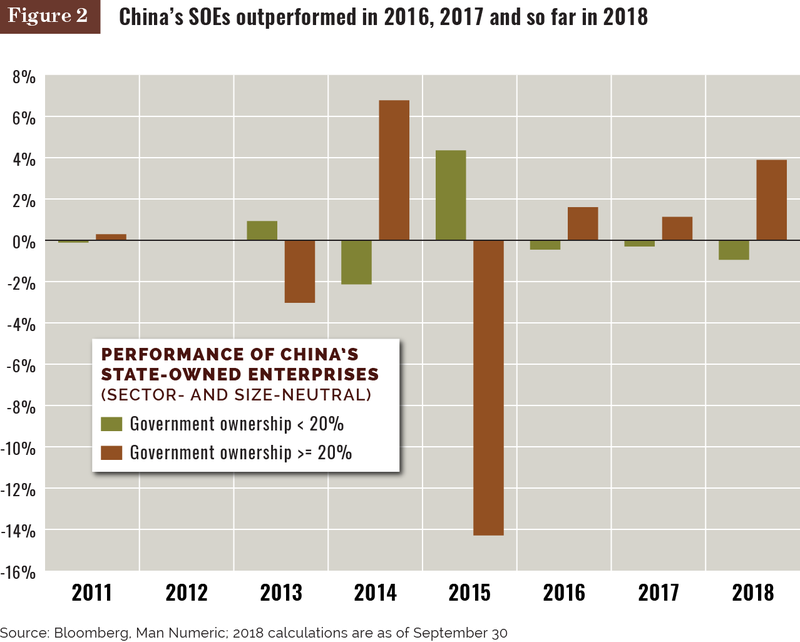 More recently in 2018, and specifically during the third quarter, companies with higher government ownership outperformed the broader China A-shares market on a sector- and size-neutral basis. We believe this is because SOEs are less affected by the ongoing deleveraging campaign in China and less sensitive to credit risk, thanks to higher quality bonds, lower borrowing costs and less reliance on shadow banking. Additionally, SOEs — because they are large-cap and cheap on average —tend to be more "value" than "growth." This hasn't necessarily worked in SOEs' favor in the past — this past third quarter notwithstanding. However, we believe that as the Chinese growth stocks, and specifically those in the technology sector, lose their sheen, value stocks could take their place. Our view is that just because a company is an SOE, doesn't mean there isn't value. In fact, the China A-shares market generally represents a potentially compelling investment opportunity for foreign investors looking to diversify their portfolios, from both an alpha and a beta perspective. Crucially, financial investors have had very limited opportunity to participate in this growth owing to various capital limits imposed by the government. However, this has begun to change in recent years, with the launch of the Shanghai-Hong Kong Stock Connect program in late 2014, which allowed international investors to purchase A shares traded on the Shanghai Stock Exchange via Hong Kong-based brokers, and a similar program for the Shenzhen Stock Exchange in December 2016. The opening up of the stock market would be of limited use to large international investors if it did not offer liquidity in line with its economic stature. 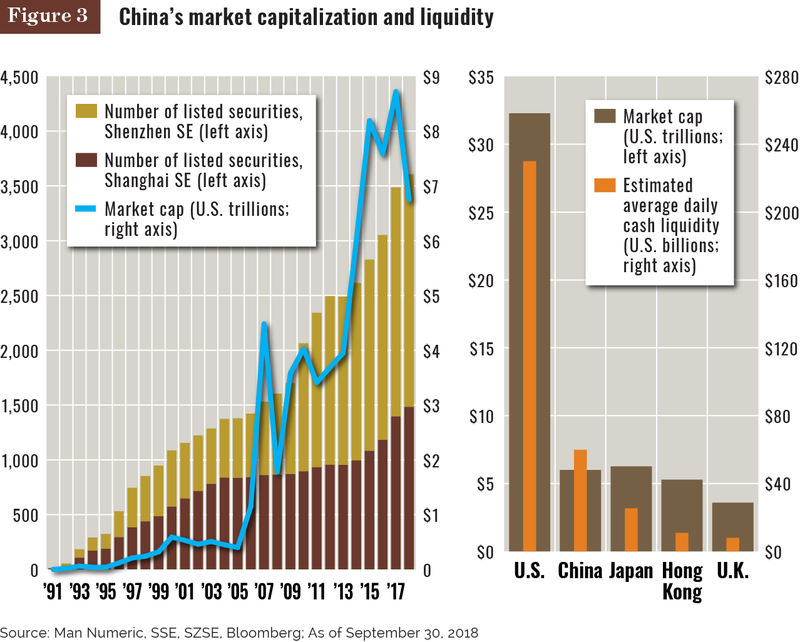 On this front, the progress of the Chinese market has been both dramatic and impressive — in just 25 years of existence it has grown to become one of the world's largest and most liquid equity markets in the world (Figure 3). From our perspective, the universe of Chinese stocks considered to be "investible" has doubled in the past seven years, with the median stock within this group having a market cap of $800 million and average daily liquidity of $5 million. The A-shares market also has a number of structural attractions for professional active investors in particular. First, while less specifically an argument for an active approach, the A-shares market can help provide diversification from developed and emerging markets. Albeit more limited since the launch of the Stock Connect program, the potential diversification benefit is greater than from the China H-share market, due to its more limited access for foreign investors. The average correlation of the MSCI China A-Share index with the MSCI Emerging Markets index and the MSCI World index since 2005 has stayed below 0.3 and 0.2, respectively. For investors who already have exposure to China through H shares — shares of companies incorporated in mainland China that are traded on the Hong Kong Stock Exchange — the A-share market might still represent a real diversification opportunity since the average correlation between these two markets has historically been 0.5. Secondly, there is the notable increase in domestic retail investor interest to consider: individual investors make up 80% of the trading volume in China's stock market. We believe this is an opportunity for skilled active managers seeking to generate alpha. A well-known feature of the Chinese equity market is the high incidence of government ownership. Since such companies may not be run solely on the basis of profit or shareholder interest maximization, their performance might lag private-sector counterparts, with their stock trading at a discount. Active investors skilled in recognizing and modeling investor biases could therefore have a potential edge in this sector. Additionally, as China continues opening up to foreign capital, it is increasingly clear to us that foreign investors can no longer afford to ignore that market. Low historical correlation to both developed markets and other emerging markets suggests a potential diversification benefit from investing in China A shares, while the high retail investor base provides an alpha-generating opportunity for the savvy stock-picker. Ori Ben-Akiva is head of international strategies, Mickael Nouvellon is portfolio manager and researcher, and Ziang Fang is portfolio at analyst at Man Numeric, Boston. This content represents the views of the authors. It was submitted and edited under Pensions & Investments guidelines, but is not a product of P&I's editorial team. Commentary: Machine learning in quantitative investing – revolution or evolution?